These are exciting times! Never before have we seen more new technologies being delivered internally or new products and services being delivered to customers. Today’s organizations are faced with challenges to meet increased service level agreements in many cases with outdated tools, strained resources and no processes in place to capture and reuse knowledge to provide acceptable support. If Knowledge is Power, many companies today are suffering severe power outages and disruptions to service! It is estimated today that 23% of a company’s knowledge walks out the door every year. The value of a company is not solely based on the products and services that you provide, but how you provide them better that your competition. Service and support is a driving factor in how consumers make their buying decisions. More and more, companies are realizing that the knowledge management solution they use is an important asset that insures a competitive advantage and a key component to implementing advanced technology. Effective support of new internal technology roll outs and new products and services could make a difference in you making your goals or increasing the risk of failed projects or error prone product roll outs. In this webinar, you will hear how customers of an advanced Knowledge Management solution from ComAround are driving significant and measurable return on investment for their companies. Julie L. Mohr, world-renowned author and thought leader, and Maria Cronfalk from Stockholm University will share how to drive innovation through the capture and use of knowledge both within IT and administrative processes. In this webinar you will learn how Knowledge is the key to finding new ways to innovate and drive lasting change on campuses around the world. Knowledge management is one of the largest untapped assets for many IT service desks according to Gartner. Companies have tried many ways of harnessing knowledge – with mixed results. 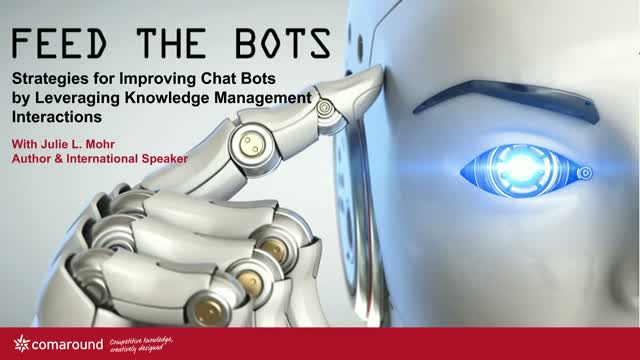 In this webinar Per Strand from ComAround explains why KCS® (Knowledge-Centered Service) appears to be exactly the kind of structured, platform-agnostic approach which finally unlocks the power of knowledge and opens the door for new intelligent technologies like AI, Machine Learning and smart BOTs. This webinar will discuss how to use knowledge management methodology and intelligent technology to bring company ethos and knowledge all the way out to your customers. The discussion focuses on how to source knowledge in the modern enterprise and make sure that it generates full value all the way to supporting customers in all channels. The benefits are huge and gives your organisation reduced costs, increased revenue, improved workforce productivity and customer satisfaction.